What is your policy regarding service dogs? Out of Africa is a full-contact facility, where keepers interact with animals inside their enclosures. Bringing service animals near an enclosure while keepers are inside may result in serious injury. For this reason, service animals are required to remain on trams with their owners when on the preserve. Dependent on the specific situation, service dogs may be permitted to walk directly from trams to shows and back again. When at the Tiger Splash™ Arena while big cats are present, they are required to sit at the back of the stands (out of view of the big cats) and remain still throughout the show. 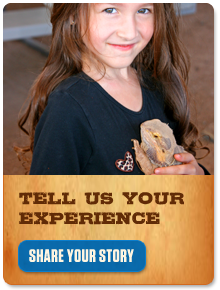 They are not permitted to ride the safari tour where people come in direct contact with exotic animals. If possible, we recommend that patrons board their service dogs at a local kennel facility.